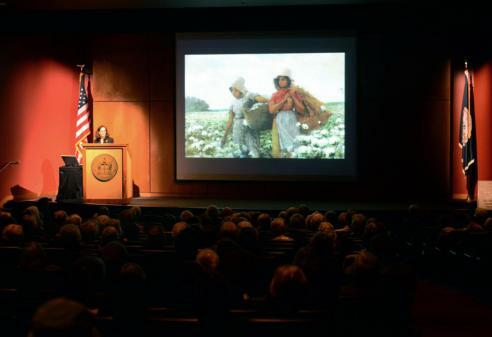 We offer a wide variety of member-only lectures and programs that feature renowned historians and authors. The following special events are open only to members. Invitations are mailed to members before each event. Learn about the wide variety of members-only lectures and programs that feature renowned historians and authors. We offer three member-only lectures each year. Read more about the Stuart G. Christian Jr. Lecture, the Hazel and Fulton Chauncey Lecture, and the J. Harvie Wilkinson, Jr. Lecture below. The Stuart G. Christian, Jr. Lecture was named in honor of a former president of the VHS and takes place every year in April. The 2019 Stuart G. Christian, Jr. Lecture, featuring Douglas Brinkley, will take place on April 17. Named in honor of their parents by Edwin H. Chauncey and Warren F. Chauncey, this lecture series focuses on topics in Virginia, Civil War, or southern history. The 2019 Hazel and Fulton Chauncey Lecture, featuring Ben Wynne, will take place on July 17. The J. Harvie Wilkinson, Jr. Lecture is named in memory of Virginia banker J. Harvie Wilkinson, Jr., and takes place every year in October. The bus trips are a great way to learn more about the fabulous history of Virginia (and sometimes even beyond). The trips always provide a nice lunch and the wonderful company of fellow society members. “Virginia Journeys” is a fun and educational way to spend the day! Have you ever wanted to visit a historic location in Virginia but did not want to deal with the hassle of planning a trip or fighting traffic? Leave the planning and driving to us! Our member-only monthly bus trips travel to historic sites and museums. These day-long bus trips leave Richmond in the morning and travel to places such as Washington, D.C., Charlottesville, art museums, private homes, and many more exciting locations across the commonwealth. You will be led by staff members and experienced tour guides, who will not only inform you about history but also make sure you have fun. Lunches and snacks are provided on each trip. Louisville has Derby Day. London has Royal Ascot. And Richmond has Garden Party Day. For more than sixty years, our annual Garden Party has been a highlight of the calendar year for our members. This annual event takes place at Virginia House from 4 to 6 p.m. on the last Saturday of April. Members and their guests are free to spend the afternoon enjoying the spring flowers, delicious refreshments, and lively conversation in the gardens. Learn more about Garden Party. As a way of thanking our loyal members, the VHS holds a yearly members appreciation reception. During this after-hours event, members have the museum to themselves and are free to explore the galleries or mingle with staff and other members. Spend time exploring history with fellow members. One of our previous excursions was, "Asheville, North Carolina Land of the Sky," which included tours of the Biltmore Estate and Gardens or the Asheville’s River Arts District; Blue Briar Cottage; a special opening only for our group at Rose’s Garden Shop; and private dinners at Pack’s Tavern and the Omni Grove Park Inn. On occasion members have the opportunity to travel abroad. Examples of former abroad trips include: Clash of Empires in the Caribbean; Eagle Ascending: From Normandy to the Borders of the Reich; and A Tale of Two Cities: London and Berlin at War, 1939-45. If you are not a member, or your membership has expired, and you would like to attend one of these events, please contact me at 804.342.9658 or mweber@VirginiaHistory.org.